SlideFab 2 is a simple-to-use software. Nevertheless there are some requirements which need to be fulfilled. Basically, there are two different kind of requirements: a) Technical premises and b) minimum user skills. 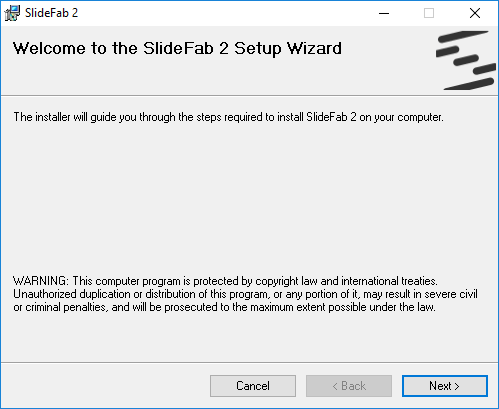 SlideFab 2 is an add-in for a Windows-based installation of Microsoft Office, of course with Excel and Powerpoint installed. Microsoft Office needs to be version 2010, 2013, 2016, 2019 or 365 both 32 bit and 64 bit. Windows needs to be 64 bit edition for versions like XP, Vista, 7,8 or 10. The Windows installation requires the .NET-framework with version 4.6.1 or later. In order to install SlideFab, the user requires elevation. The installation will be on a per-user basis. Creating Powerpoint presentations. Adding slides. Inserting shapes, tables, charts, etc. Constructing Excel workbooks with the information and elements user for the automation. Creating calculations and formulas. Creating charts. Etc. Understanding the concept of for loops, i.e. FOR EACH element in some list, DO this and that. This is important as in SlideFab 2 this defines the mass-creation logic, like FOR EACH cell in some range DO create a new slide and fill slides with defined elements. Writing and using VLOOKUP or INDEX/MATCH formulas in Excel. These lookup formulas are key when creating Excel models used for automation. They are particularly helpful when getting or calculating based on the current round of the for loop. What the user get's out of SlideFab 2 depends on the individual skill level in foremost Excel and Powerpoint. The hurdle to start with SlideFab 2 is not so high, as explained above. Nevertheless, the concept of building an Excel workbook ready for a for loop might be unknown territory for most users. But it is easy to learn as it is typically one of the first concepts introduced at coding courses at school. The blog contains examples and video tutorials explaining how to set up these loops. This can be a good starting point.